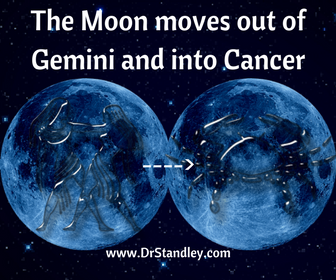 The Moon is in Gemini until this afternoon at 1:59 PM EDT where it will then move into Cancer. 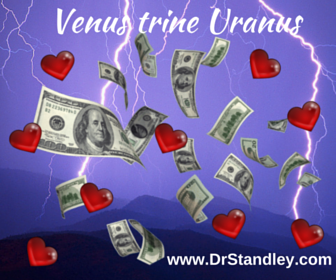 The BIG NEWS today is Venus trines Uranus, which as you can see with the Astro-Meme that this aspect is represented by two lightning bolt strikes, one representing Venus (Love) and the other representing Venus (Money). Venus naturally rules the 2nd house of self-worth, personal finances, personal possessions, morals and values, while Venus also rules the 7th house of committed relationships, contractual unions, marriages and partnerships. Uranus is the planet of 'sudden change in circumstances', which also rules lightning. BAM! Just like that, the circumstances with money and Love changed and since this is a trine (and a trine is fine), then this my dear little mentators is a super-friendly aspect where money and Love are concerned. What's even more fantastic about this aspect is the support it gets from other surrounding aspects and transits, such as Jupiter in Scorpio turning Direct yesterday and the New Moon in Cancer occurring tomorrow. There is tough opposition coming from the Sun in Cancer opposing Pluto in Capricorn that will occur tomorrow during the New Moon in Cancer, but hey, isn't that always the case when something truly wonderful is going down, there always seems to be opposition to it or someone who attempts to rain on the abundance parade. This is True for anything in Life where everyone just can't be happy at the same time. 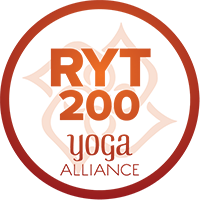 Even more, the Sun opposing Pluto occurs once a year, every single year, and has been occurring every single summer between Cancer and Capricorn since 2009 and will continue until Pluto moves out of Capricorn and into Aquarius in 2024. Then in the summer of 2025 this aspect will occur between Aquarius and Leo. So there ya' go. 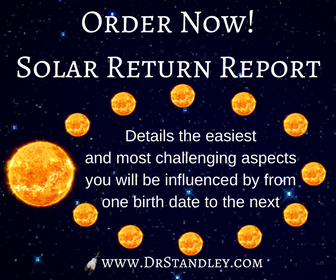 DO NOT allow the Sun opposing Pluto to rain on this wonderful parade of the the Sun trine Uranus and the New Moon in Cancer because you experience this aspect once a year, every single year. It's a pattern folks! It's a pattern! So quite honesty, you should be familiar with this aspect and no longer repeating its pattern. If you get caught up in opposition, that's on you. Enough of that for now, let's talk some more about Venus trines Uranus. Note that the Astro-Meme has a two lightning bolt strikes, one representing Venus (Love) and the other representing Venus (Money). This is a time to truly decide to enjoy living your Life rather than just finding another insignificant thing to complain, Tweet or post about on social media. My Goodness folks, embrace your own happiness. CHOOSE TO BE HAPPY! It is a choice. When you fully embrace your own pursuit of happiness, it could make you appear a little out of the ordinary to some people but what do you care? Right? Uranus is the planet of the unusual, the unique and the out-of-the-ordinary. Remember, Uranus is the tilted planet, which spins on its side. How unusual is that? So you see, this is unusual energy. 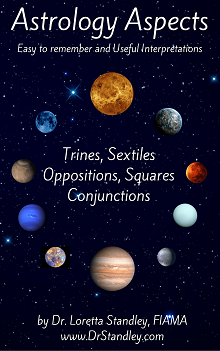 This trine between Venus trines Uranus produces an intuitive ability in financial matters. This aspect has the ability or potential to attract Good fortune just by thinking about it or through focusing on such things through reciting affirmations or adopting a more positive outlook. Simply because of a positive outlook and approach to Life, you can attract money, people with money and beneficial financial circumstances. This aspect reveals sudden Good fortune. 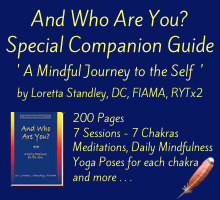 Depending on the status of a relationship, this aspect can change the status of a relationship in the blink of an eye. For instance, if a relationship is laced with difficulty, problems and negativity, the relationship could suddenly end. If a relationship is loaded with Love, respect and support, the relationship could suddenly blossom into an engagement, elopement or a sudden financial windfall for the couple. So you see, depending on your circumstances, your focus, your attitude, your take on Life and your choice, that will depend on how this aspect impacts you. 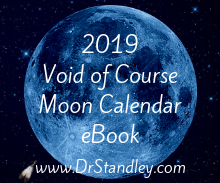 Venus trine Uranus will occur again February 2, 2019 which is a long way away folks! 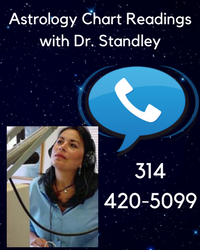 Embrace this wonderful energy shift now! Download the 'Venus trine Uranus' chart wheel here! The Moon in Cancer sextile Venus in Virgo at exactly 5:09 PM EDT. You will feel this energy within 12-14 hours 'before and after' it occurs. The Moon in Cancer sextile Uranus in Taurus at exactly 5:36 PM EDT. You will feel this energy within 12-14 hours 'before and after' it occurs. The Moon in Cancer opposing Saturn in Capricorn at exactly 9:38 PM EDT. You will feel this energy within 12-14 hours 'before and after' it occurs. 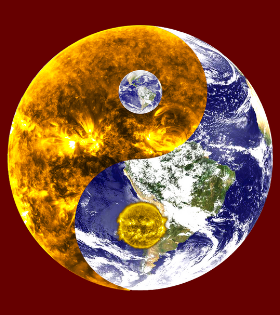 Venus in Virgo trine Uranus in Taurus at exactly 11:26 PM EDT. This aspect began in applying (approaching) degrees on July 4th, it is exact today, and it will remain present in separating degrees until July 18th.